The pope died on a Saturday. It was April 2, 2005, and everyone knew it was coming. Now, nearly eight years later, as his successor retires, and the College of Cardinals selects a new pope, the memories of the death of John Paul II come flooding back, vivid and strong. I was living in Rome at the time and I remember that it had been unseasonably warm that day, and for about 36 hours, tens of thousands of concerned Catholics had been gathered in St. Peter’s Square, wearing short sleeves, and craning their necks up toward the windows of the papal apartment. They were waiting. The entire city of Rome was waiting, holding its collective breath, uncertain what would transpire once John Paul II passed away. The events that did transpire over the next two weeks would defy the expectations of even the most faithful followers of the Holy Roman Church. It would be the greatest public outpouring of grief that the world had ever seen, and no one was prepared. At just after 9:30 pm, they turned off the lights in the pope’s bedroom window, a public sign that he was gone. I was at my apartment, watching on TV. The cameras panned across the crowd, some weeping, some singing, some praying hand in hand. Within moments, I began to hear bells ringing out from every church and cathedral in my neighborhood. I went to bed that night thinking that most of the craziness was now behind us. I had no idea. The next day, the influx began. Suddenly, every flight into Rome’s two airports was overbooked, every train full, every bus packed, and every hotel room reserved or occupied. The announcement had been made that visitation would begin the next day, Monday, and continue through Thursday, the 7th. Viewing their beloved pope as he lie in state would give closure and certainly bring a special blessing, and it seemed that the better part of the Catholic world was determined not to miss it. On Monday morning, the sun rose over a city in chaos. In less than forty-eight hours, four million mourners had descended on Rome, more than doubling the city’s total population. It was impossible to move. At that time, I was commuting downtown everyday, studying Italian at a school not far from the Vatican. My stop on Metro Line A was the third down the line, so I was able to push onto an already crowded train. A couple more stops, and the metro was full. This was the train to the Vatican, and they simply had to get there. So at every station, the crowds pushed and heaved, crushing black clad mourners up against the sides of the cars. Trying to get off and make a run for it was hopeless, there was no fighting the incoming flood. Police tried in vain to push back the throngs, but there were simply not enough metro trains to accommodate the crowds, and the people knew it. I began to feel panicked, and squeezed my way toward an exit. Eventually, at the Barberini station, the cars were so tightly packed that the doors would no longer open. People began to shout and scream. I had to get out. I reached above my head for the red emergency lever, and pulled it. Every door on that car hissed and slid open. A mass of sweating people collapsed out into the station. The police were fighting back crowds, and I made a run for it up the steps, out of the station, and into open air. Over the next couple of days, the situation deteriorated. The city’s infrastructure couldn’t handle the grieving masses. People were sleeping in the train stations, on church floors, and curled in doorways. The wait to view John Paul’s body had reached fifteen hours, and was still growing. In an effort to accommodate the hordes of pilgrims, the city government had pressed every available city bus into service, and even brought some in from surrounding towns. Gridlock ensued. With so many buses on the narrow roads, downtown became a parking lot. As a result, people abandoned the buses en masse, and began circulating through the city on foot. The funeral took place on Friday, the 8th. The city was shut down in its entirety, and all traffic was banned from the roads. Helicopters circled overhead as more than one hundred world leaders, including every surviving U.S. President, made their way toward St. Peter’s Basilica. Three hundred thousand people made it into the square for the Requiem Mass, and millions more watched on video screens in the surrounding streets. It was the largest funeral gathering in recorded history. With John Paul II safely entombed in the earth beneath St. Peter’s, the crowds began to disperse, and like a depleted hostess, the city of Rome collapsed in a chair, sweating and exhausted. It was, however, nothing more than a temporary reprieve. The College of Cardinals would begin their conclave just ten days later, with an eye to electing the next pope. By April 18, the 117 cardinals who govern the Roman Catholic church around the world had convened in Rome for the Papal election process. They were supervised by their dean, Joseph Ratzinger of Germany. With them came hundreds of thousands of pilgrims, refreshed and ready to celebrate the coming of a new pontiff. 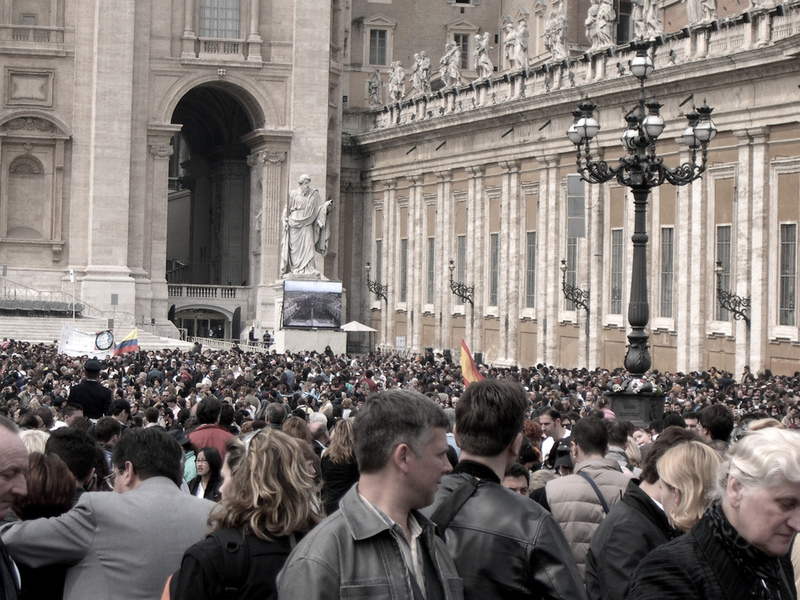 Scores of the faithful kept vigil outside in St. Peter’s Square. Their eyes were fixed on the chimney that rises above Michelangelo’s famous ceiling. The cardinals vote three times each day, and after each vote the ballots are burned in the furnace. A powder is added to the fire to give it color. Black smoke indicates that no consensus has yet been reached. White smoke means there is a new Pope. The first day’s ballots proceeded in turn, black, black, black. The crowd in the square grew, and tension mounted. Tens of thousands camped on the cobblestones outside the chapel that night. There were two ballots the following morning, black and black. However, at 3:50 that afternoon, white smoke began to pour out of the chimney. The Conclave was over. The crowd cheered. Word of the election tore across Rome like thunder. I have never seen anything like it. The entire city instantly shut down. Every Catholic in town knew that they only had about an hour from the election in the chapel to the official unveiling of the new Holy Father. The streets leading toward Vatican City were immediately at a standstill. People abandoned their cars, leaving them sitting in the middle of the road, heading off on foot for St. Peter’s Square. I saw shop owners desert their stores, and nuns hike up their dresses and run toward the peeling bells. An hour later, thousands cheered as Joseph Ratzinger himself, Dean of the College of Cardinals, stepped out onto the balcony, wearing a white robe, and calling himself Benedict XVI. There was a new pope in town, and he was not what many were expecting. Most of my Italian friends were a bit let down by the selection. Ratzinger was a conservative and fundamental Catholic theologian, who many saw as inflexible and old-fashioned. They feared the church would backtrack on many of John Paul II’s reforms. The next day, as pilgrims began to stream out of the city, I met up with a friend. He was a professor at La Sapienza University in central Rome. “What do you think of Benedict?” I asked. My friend called Benedict a placeholder between John Paul and whomever would come next, a pontiff that we now know to be Jorge Mario Bergoglio of Argentina. Then he ventured a prediction that turned out to be a prophecy: “I give him less than ten years.” I can only wonder whether my friend would forecast something similar or wholly different for Pope Francis.